Watch & Win: Host Your Own Watch Party for UNITY’s First Virtual Conference – UNITY, Inc. Please join us for UNITY’s first ever Wellness Warrior Virtual Conference! In efforts to be inclusive of Native youth who are unable to attend our Conferences in person, we are live-streaming this free interactive training for Youth Councils to watch together! Contact us for ideas on hosting your own Watch Party! 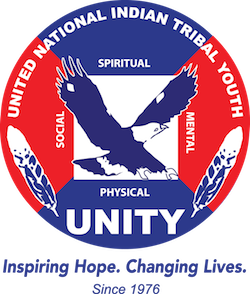 UNITY Wellness Warriors will be offering incentives available to those who watch live (including National Conference Registrations, Skoden swag and a limited edition pendleton blanket). Watch Parties are a new way for people to watch videos, webinars or trainings together in real time. The idea is to have Youth Councils from across the nation tune in simultaneously and interact with our guest presenters using Youtube Live and the UNITY Webinar software. Even if you can’t watch live, registered participants will be sent a recorded link of the training afterwards. Note: Prizes are only available to Live Registered Participants. Ask Two Questions to the Presenters in the chat anytime throughout the Virtual Conference on Friday April 5th. ← Monthly Giving for Pendleton Blankets!